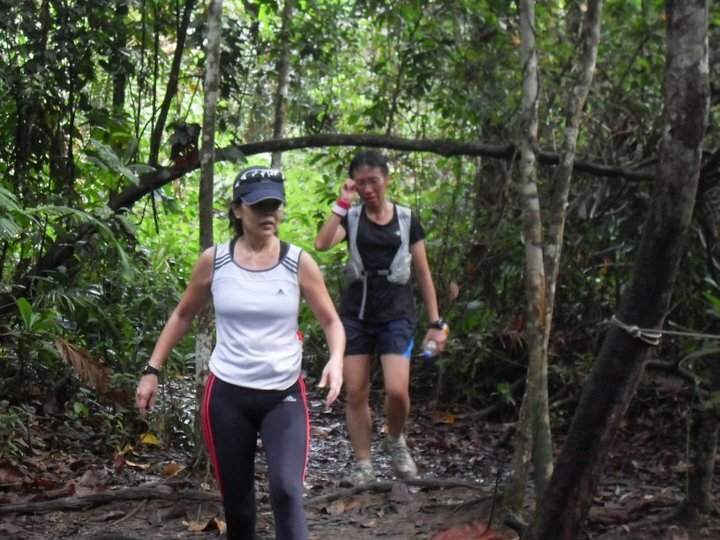 Since I couldn't run, RSM Jancy or Brokie as she is more famously known has contributed the field report for the final TNF Trail Run Series at the infamous Woodcutter's Trail. Below is her account of the run with photographs from fellow run leaders, John and Kelly. Talks about the much anticipated Woodcutter Trail (WCT) Run started on Friday afternoon when parts of the island started to rain. 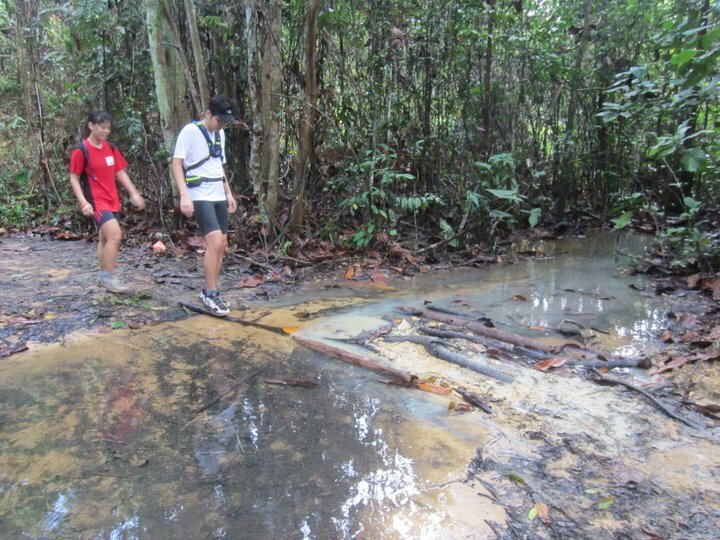 Those who run trails often enough will know why we the TNF Run Leaders were lamenting. Slippery…. Mud…. Wet… wash shoes…. Hahahaha….. But aren’t all these what trail running is made up of? Chris, Molly, Kelly and I arrived in one car at the Upper Peirce Reservoir Car Park slightly after 7am. :P We were late…. :P The runners were already interacting among themselves. Some tying their shoe-laces, some doing final adjustment to their hydration bags, many bantering…. After Chris gave a snappy briefing in his happening new shoe, off the merry runners went. We trotted for about 500m, I think, before we came to the entrance of the WCT. There wasn’t a prominent sign stating that. Someone who knows the way has to show. This is precisely what we run leaders were there for. 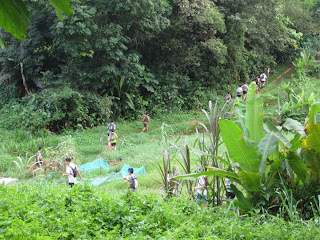 To show the way…..
We went over a mini orangey yellow mud ridge and came to a rusty green barricade. What barricade? Nothing can stop us! Some went over the barricade while some went around it on the right and down the slope. After this, it was a long windy, undulating and laden-with-obstacles trail. Those who didn’t want to be slowed down will just bash through or leap over. For me, I wouldn’t want to find out how deep the pools were. I avoided them all by slowing down to a walk and looking for the driest path around them. Heh…. This one I don’t know how the rest did it but I did the same as what I did for #1. This is to minimize the effort required to wash my TNF Trail Shoes. There were 3 to cross. 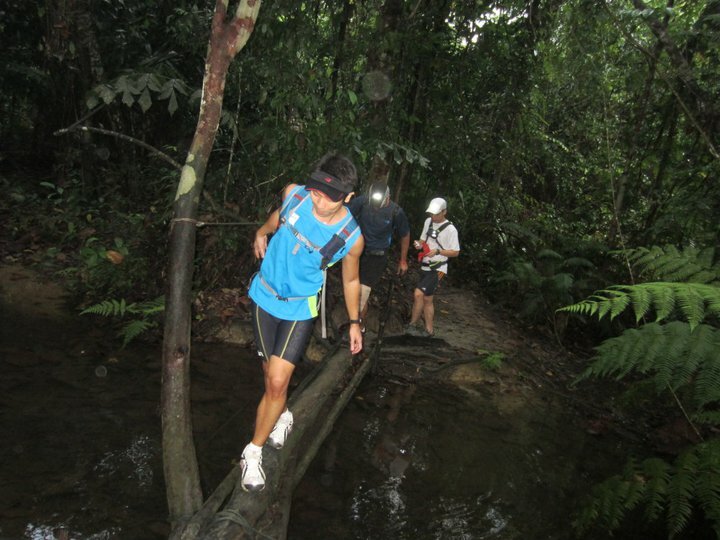 There were logs placed across them so the runners can avoid wetting their shoes. But on the return leg, these streams seemed to have swelled and I got my shoes wet. Sigh…. I must be damn exhausted by then because I found it a challenge to balance on these logs and needed the help of a fellow runner behind me. Thanks, Sim! There were about 3-4 of them which fell cross the narrow path. They were there a week ago when we did a recce run. Must be the weight of the rain on the leaves and branches. There were more low-hanging branches. These branches would be swung back by the front runners and they smacked right into the faces of those behind. 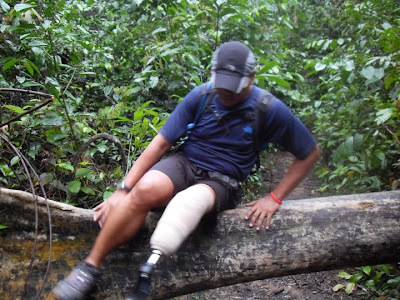 Don’t just grab anything you see for support in the woods. There were thorny vines and one would be very sorry to hold onto one for support by mistake. I think Suan learnt it the hard way. As for me, I think I ran into one such vine. The thorn broke off and was embedded in the middle of my thigh. The wound kept bleeding until I stopped running to remove the thorn. Gosh! What a thorn in the flesh! I am very very bad at running up hills. My run reduced to a jog and then to a walk every time I came to an up slope. I really admire those who could sprint up hills…..Boy! How did they do it? Doesn’t gravity act on them? After this, Terence Lim led the way again. But not long later, he realized it was the wrong way. We only ran wrongly for a very short distance but when we turned back, the whole party behind us was already on the right track. Henry Han, our guest run leader, was leading the right way. I wonder how Terence knew that he was wrong. Everything in the forest looked the same. Hm…. Must be the markers we made a week ago. Our markers were the plastic red-white tapes we tied on the branches at strategic points. Soon we were out of the WCT and made our way to the vegetable plots of Zhenghua and the Gangsa Trail. We brought the runners into an unmarked trail which we discovered in one of our discovery runs. This trail is called the Fisherman’s Trail (FT). Here in the FT, something happened. A runner called Triple, his nickname in SGrunners.com, suddenly yelled out loud and threw his 2 bottles of water away. He stopped and pulled his sock down. Something bit through his sock. It must be very painful. I left him to check out his bite and led the runners on. When I emerged from the FT, no runners were insight. I decided to wait at the exit in case the runners behind me didn’t know which way to turn. Honestly, I needed a break. Hahaha…. I took this opportunity to catch my breathe. Soon, a few runners arrived and they told me something happened back in the trail. Amy was bitten by something just below her glute. That something bit through her Adidas tights. Hm… it must be the same something that bit Triple. To buy more time for resting, I told the runners about our friend Francis who was bitten by something. This something caused him high fever and a swollen leg and a few days in the hospital bed because of blood infection. I later also told Amy and Triple about it so that they can monitor any not-so-good development. The whole group then gathered at a little bridge. We were going to enter the WCT again and the entrance is an obscure one. It was mainly an uphill course and very soon we came to a flat grassy opening which was the second spot for a picture. We called it the S. Why? Because the route traces the letter S.
After this, it was all the way back to where we started. Some runners picked up pace and ran all the way. I decided to take it easy and led whoever was willing to run my pace….. which was snail-pace. Hahaha…. I was delighted when I spotted the rusty green barricade and called out to Suan who was a short distance behind me. She, too, was glad to be out of the woods and seeing the sun again. You see, 95% of the time, we were in the trail under the canopy of the forest. I would like to mention one runner. He is Roger. 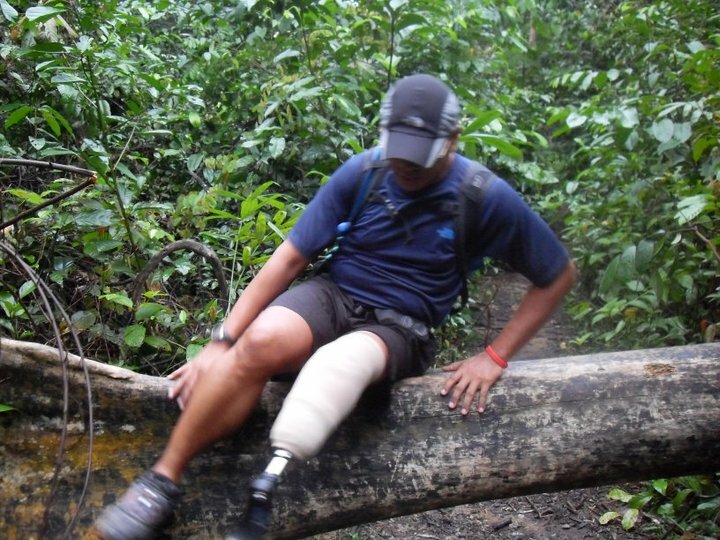 When I met him 3km into the trail, he had already sprained his ankle. I told him he could turn back if he wanted to and that if he went further, he would have a longer distance to run back. He decided to carry on running. I ran behind him for a while. Though injured, he still turned back to look out for me a few times. Then we came to slippery slope and I witnessed Roger slipped. OUCH! Although it was not my ankle, I could feel the pain for him. Aiyoooo…… But our brave Roger soldiered on. He could still run faster than me, you know. At The Four Stones where we took our first group picture, I gave him some heat rub. I didn’t see Roger anymore until 2-3km towards the end. He was walking with his friend, Kok Leong. I learnt that Roger sprained his ankle for the third time and this time he was beaten. I must say I admire that die-die-also-must-complete-WCT spirit of his. I do hope his ankle is feeling better now. Back at the car park, Karen and Carey, as well as Christopher, welcomed us back with Gu gels, sports wash and sng bao. Today I brought mangoes. Ooh la la…. Icy cold mangoes taste so damn good after a run. The last to return were Roger and Kok Leong. Luckily there were still some mangoes and sng bao for them. Trail running is made of these : friends, mud, sweat, laughter and sng bao…..
With this run, we conclude the first ever North Face Trail Run Series, an initiative by The North Face Singapore. 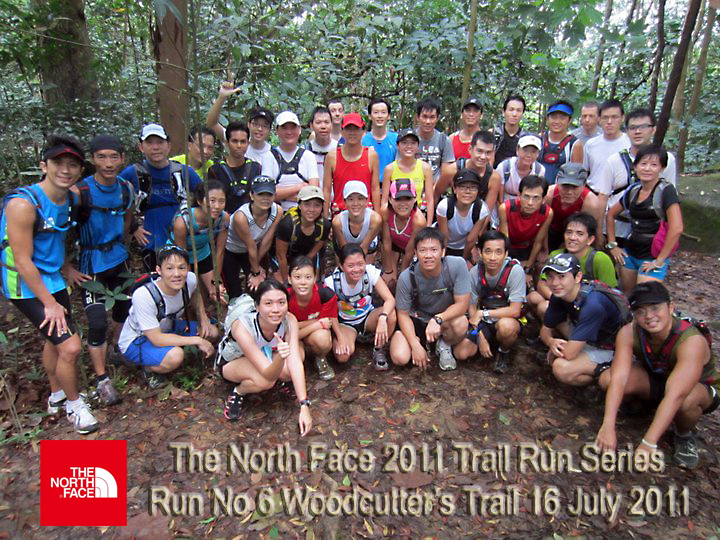 On behalf of my fellow run leaders; Francis, Terence, Shu Ming, John, Alvin, Kelly, Jancy, Molly) we would like to thank TNF Singapore especially Karen and Carey, and all participants for their support. 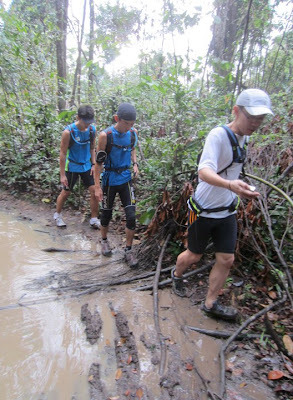 Many thanks also to the Too family led by Henry Han for helping us with the route planning and showing us some of the routes. 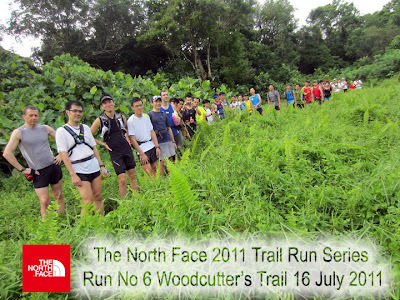 We hope those who have participated have enjoyed the trails and have as much fun as as we had in bringing this run to you. We also hope that through this series of runs, we have managed to bring the beauty and majesty of nature that can be found in this tiny little red dot we called home to everybody. Once again, many thanks to everybody for allowing us the privilege of leading you in the runs and for the friendship and camaraderie.